China’s economic growth is slowing, but Beijing has a plan to keep people from feeling the pinch. China’s efforts to rebalance its economy to a consumption-driven, service-oriented model are set to get a big boost next year, when the 13th Five Year Plan (FYP) will be officially ratified. The FYP will set China’s official economic and social targets through 2020, and the proposal that was adopted after the Chinese Communist Party’s fifth plenum suggests it will be heavy on the sort of reforms that were first floated in 2013: boosting innovation, increasing consumption, and opening up China’s financial markets and service sector. Some of parts of China’s economic transition, however, are easier than others. For example, Beijing is actively boosting China’s service industries as part of its overall plan to increase consumption. The State Council said this weekend that it would encourage financial institutions to make it easier for “lifestyle-related businesses” (including the travel, sports, education, and cultural sectors) to get loans. And on Monday, Beijing announced new measures designed to boost consumption, including increasing imports and encouraging foreigners to spend more money inside China. But that’s the easy part of the equation: boosting growth in new sectors. The hard part is weaning China off of other sectors: heavy industry – where China already suffers from surpluses in sectors like steel – and low-end manufacturing. According to China’s economic data through the third quarter of 2015, industrial profits were down 1.7 percent year-on-year. The National Bureau of Statistics warned that “the industrial profit outlook is still not optimistic,” according to Reuters. The term ‘rebalancing’ is especially apt for China’s economic transition, because it is very much a balancing act: trying to time growth in consumption and the service sector to offset contractions in China’s traditional powerhouses of heavy industry and manufacturing. So far, China has been able to thread the needle, with growth in services offsetting a slowing manufacturing industry – over the first three quarters, the services sector grew by 8.4 percent, while growth in secondary industry (including manufacturing) slowed to 6 percent. Given the still-outsized role secondary industry plays in China’s overall economy, that translated to a GDP growth rate of 6.9 percent in the first nine months of 2015. Yet the economic powerhouse’s economy continues to slow, and China’s leaders have made it crystal clear that it won’t be allowed to slow too far. By doubling down on China’s previous goal to double GDP and GDP per capita from 2010 levels by 2020, China’s leadership has effectively locked the country in to continuing to grow by at least 6.5 percent each year. It appears, through 2020 at least, we have a hard figure for Beijing’s ‘bottom line’ when it comes to slowing growth. President Xi Jinping addressed China’s tightrope walk directly in recent comments at a meeting of the Leading Small Group for Financial and Economic Affairs. He told the group that the group must pay attention to social policies even as it makes economic decisions. China’s government must defend the “bottom line” of the people’s livelihood, effectively carry out work on employment and social security, and generally safeguard the masses’ basic lifestyles. Xi pointed out that economic policies will succeed or fail based on buy-in from the general public; thus, his argument that China’s people must see the benefits of reform and continued economic development. He called this consideration the “bottom line” for China’s structural economic reform. Yet beyond getting popular support for economic reforms, there’s a more pressing concern: ensuring the CCP itself continues to enjoy support from the people. In other words, China’s social stability – not just its economy – is at stake. For all those who question whether the CCP can continue to rule China once the economy begins to slow, rest assured – leaders in Beijing have undoubtedly given this far more thought than any outside experts. And Xi appears to have decided on a solution in two parts. First, as discussed above, Beijing is keeping a strict balance in restructuring China’s economy – making sure growth in one sector offsets slowdowns in another. This also means keeping employment figures steady (unemployment was at 4 percent as of the end of September). The second part of the plan involves increasing the role China’s government plays in caring for its people. That’s why Xi is stressing the need for social security (also an important part of China’s new FYP) and employment during a meeting of China’s top body on economic affairs. That’s also why he’s made the daring pledge to end poverty in China by 2020, lifting the remaining 70-80 million people who currently fall below China’s poverty line above it over the next five years. And it’s why China is finally moving toward carrying out hukou reform, making sure new migrants to large cities have access to health insurance and social security. Ou Wenhan, the spokesperson for China’s Ministry of Finance, told Xinhua that, although the growth in China’s national income is slowing down, it will not influence government spending on maintaining the people’s livelihood. Ou pledged that China’s government will continue to raise both the “material culture” and the happiness of its people – despite slowing growth. That’s the secret to China’s plan to make sure economic rebalancing doesn’t compromise social stability. China’s working from a relatively low baseline already; the central government is only beginning to create national networks for social security and health insurance, leaving lots of room for improvement. And economic-based legitimacy won’t be a liability should the government be able to proclaim it has eliminated poverty from China. The trick, as it always is, will be in the execution. Economic growth rates won’t be fully in China’s control, given how dependent the economy is on global demand. Can Beijing continue to compensate for the slowdown to protect its “bottom line” for social stability? 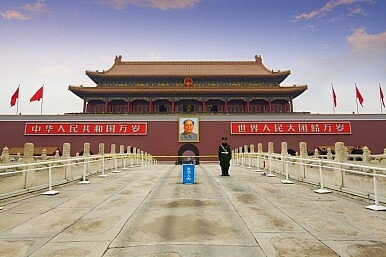 The Chinese president urged hundreds of officials to ensure China's political security amid rising risks.